Fortify your applicant evaluation process with the all new Interviewer's Assessments. Create multiple assessments, associate them with interviews and evaluate applicants trouble-free with Zoho Recruit's central Assessments module. Learn More. With this update you can preview the candidate’s resume attachment without having to navigate to the attachments sub tab. The quick view button is placed directly below the candidate’s name, near the social profiles quick links. Review and edit any mistakes or data loss by parsing candidate resumes using the Parsing Review feature. Once toggled on, the parsing review feature allows you to edit information obtained using Zoho Recruit’s many resume parsing features such as Resume Extractor, Resume Inbox, and Paste the Resume. Learn More. Let your organization’s brand value speak with Zoho Recruit’s Default Domain feature. 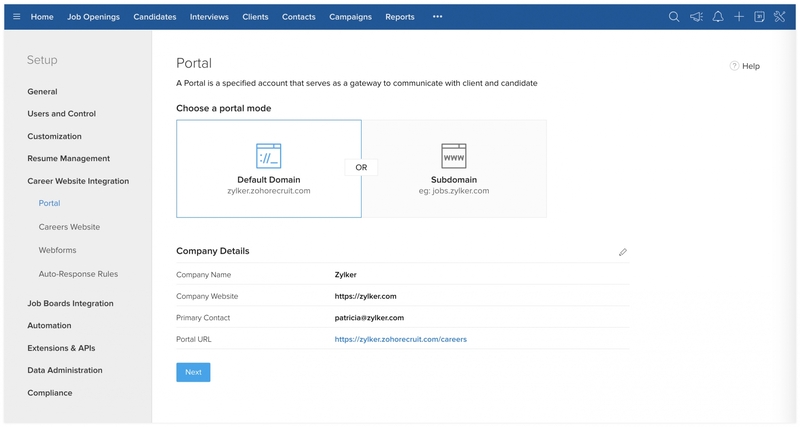 If in case your firm doesn’t have a website, you can make use of the default domain name generated by Zoho Recruit to make your job openings more appealing to candidates. Learn More. Advertise your jobs in one of the largest online advertisement platforms. 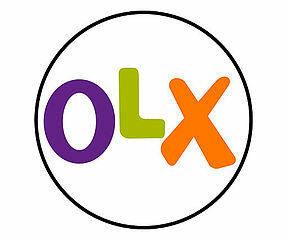 OLX operates in over 45 countries, making it one of the largest online advertisement platforms in the world. Give your jobs maximum visibility and hire from a large talent pool. VDAB is one of Belgium's most trusted and versatile job boards. They offer a versatile talent pool to cater the needs of recruiters in the Flemish regions of Europe. They also provide training to job seekers and make them "Employment-Ready". Get higher visibility, increased candidate traffic, and exceptional talent for job openings with jobs.ch, one of Switzerland’s top employment websites. Jobs.ch assists job seekers in their search by giving them higher visibility towards recruiters, thus helping them apply faster. 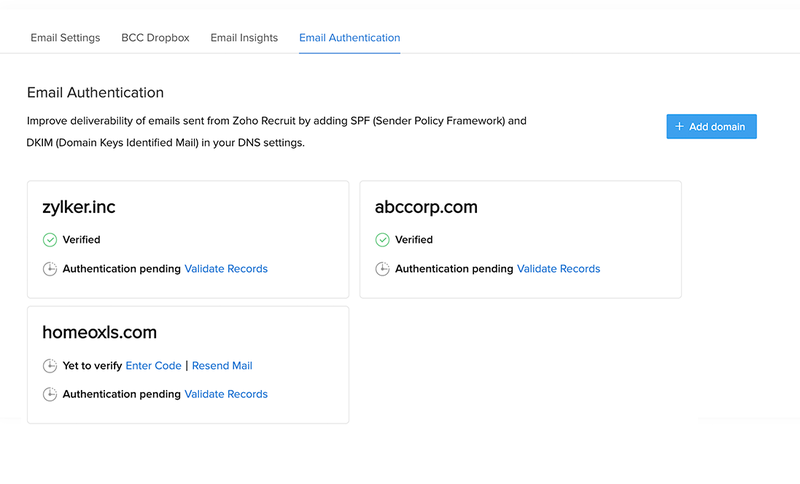 Authenticate your emails from its domain name using Zoho Recruit’s Email Authentication feature and increase the delivery rate of the emails you send in just three simple steps. Here's How! 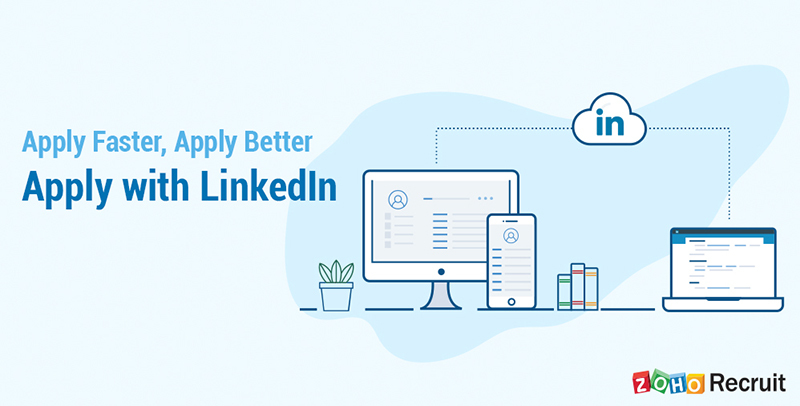 Our latest integration with LinkedIn (Apply with LinkedIn) makes job application easier for candidates by pre-populating certain fields in the job application. And the best part is, it can happen in just a click. Learn More. Our latest Resume-Library source booster is now live. Find and source the best talent from one of the most popular job boards in the USA. Get guaranteed exposure for your jobs by sharing your jobs across their huge traffic network of 100+ job sites, at no extra cost. Explore now. JobCloud is the leading player in Switzerland’s online employment market, offering various recruiting solutions. In addition to job portals, the portfolio of JobCloud also contains seminal technologies. View More. Get your digital candidate acceptance with ZohoSign/DocuSign/AdobeSign. With just a few clicks, you can start sending offer letters with your e-signature. This is a quick, easy, and completely paperless process to get your offer letter signed. Learn More. Get access to the complete candidate database of Dice from within Zoho Recruit's Source Boosters in just seconds. Dice is one of the most popular and leading career site for technology and engineering professionals, across the world. Learn more. Running background checks on candidates helps you maintain safe, compliant, and inclusive hiring practices. Zoho Recruit’s latest integration with Checkr, a popular running background screening software across the USA, helps you to make candidate checks fast and easy. All you have to do is just export your candidate record directly to Checkr from within Zoho Recruit, select the type of screening and the package. Upon completion of screening, Checkr will update the report automatically insdie your candidate record. Learn more. List out active job openings with a domain that reflects your company’s brand. Introducing default domains, just in time for your 2019 roadmap planning. Learn More. It’s important for talent acquisition leaders to be well versed in some of the common recruitment performance indicators. Introducing Recruiting KPIs. Now, easily learn the metrics of your hiring team and let success be data-driven. Learn More. Say hello to Zoho Recruit's AI algorithm that calculates an applicant's skill score and identifies the right candidates. Presenting to you, the Skillset. 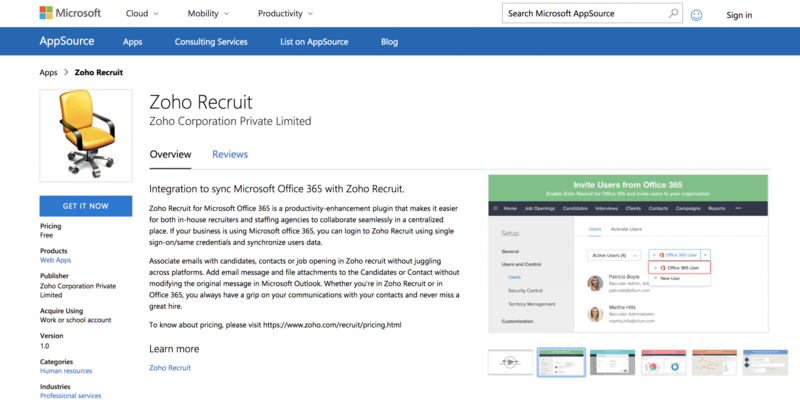 Zoho Recruit can now be found on the Microsoft Appsource and the Azure Marketplace. This integration ensures that with a single sign on (SSO) from Microsoft, recruiters now don't have to maintain separate passwords for Zoho Recruit. Not just that, they can also import Office365 users to our Zoho Recruit. Find the app on Microsoft Appsource here, and for the Azure Marketplace here. 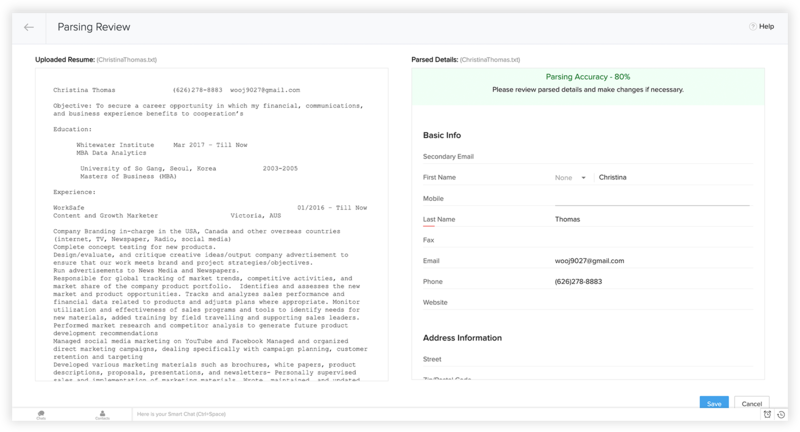 Taking our existing Resume Inbox feature a notch higher, we have now incorporated a Parsing Mode functionality that lets you control the accuracy and success rate of your email parsing results. 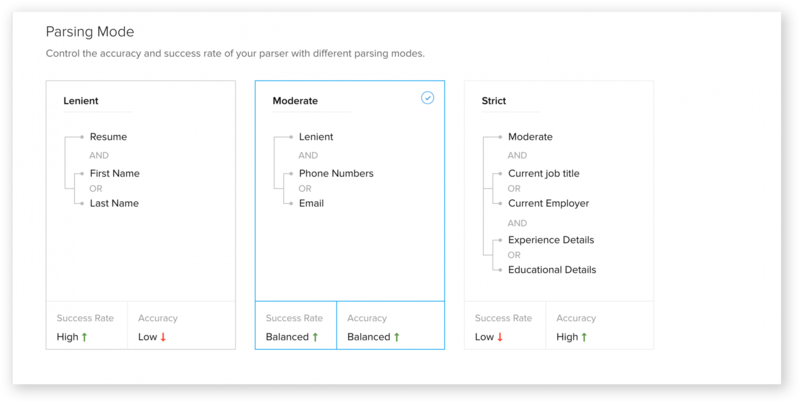 Divided across Lenient, Moderate and Strict -- each Parsing Mode has a predefined set of candidate record field values that, when activated, the parser will look for in the content that's being parsed. Consider this use case where you're for a digital marketer and 50 candidates email their resumes to your inbox -- you would need a quick way of adding these candidate profiles as records in your database. This is where the lenient parsing mode comes in. In this mode, only the resume content and the candidate's first/last name. The records added have just the candidate's name and resume attached. 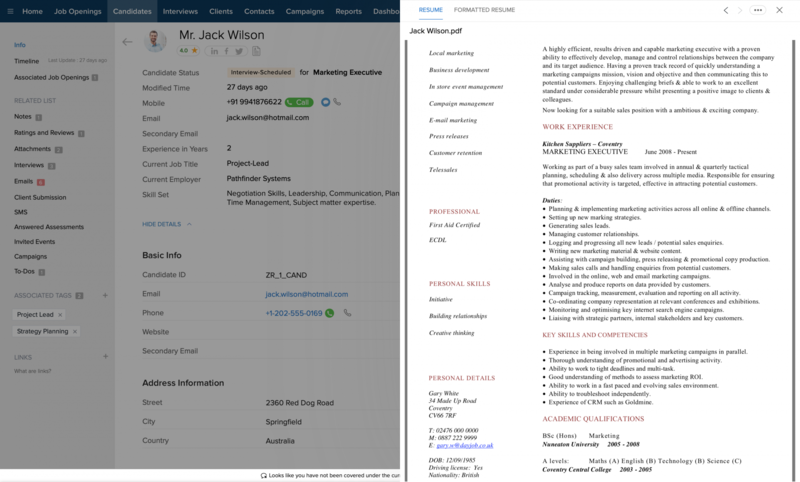 Now, the recruiter can use the formatted resume feature and quickly generate a branded version of the candidate's original resume. However, if you just have two resumes for the same, switch the parsing mode to strict will add more detailed/information rich candidate records. The moderate mode offers a middle ground between these two extremes. Learn more. 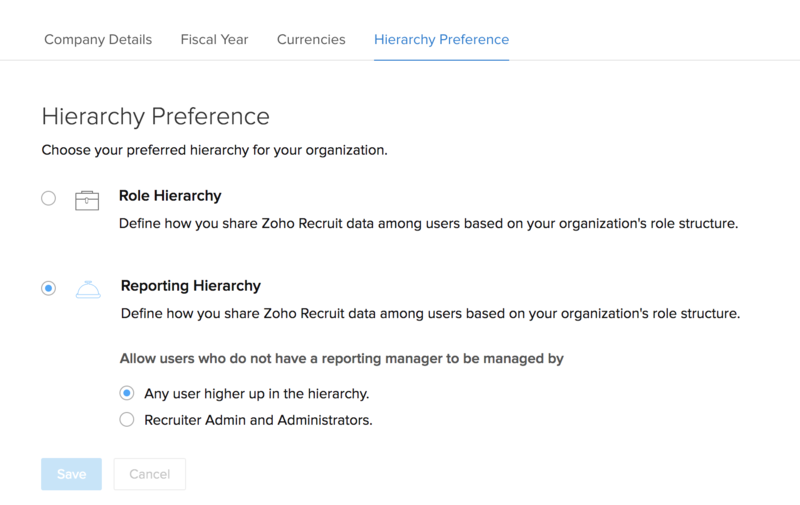 Set up your organization's hierarchy structure based on the roles that your employees play in it and assign reporting managers to users for efficient record accessibility. In this hierarchy structure, a user is assigned a reporting manager who is entitled to view or access the user's data. Only members of the organization with equal or greater roles than the user can be made as their reporting managers. Also, you can choose if the non-reporting members of your organization are managed by any superior at a higher role or by the Super admin and Admin. This structure ensures controlled access of information within the organization and also ascertains that a user has only one reporting manager. Learn more. Formatted Resume gets a facelift. Design, customize, and generate formatted resumes with the click of a button with Zoho Recruit's Formatted Resume feature. In addition to this, you can now also edit the header, footer and body sections of the formatted resume and modify templates to suit a diverse set of requirements. However, this feature is now available in beta. If you're willing to explore this, please log into the product, click on the announcement icon and get your early access link. 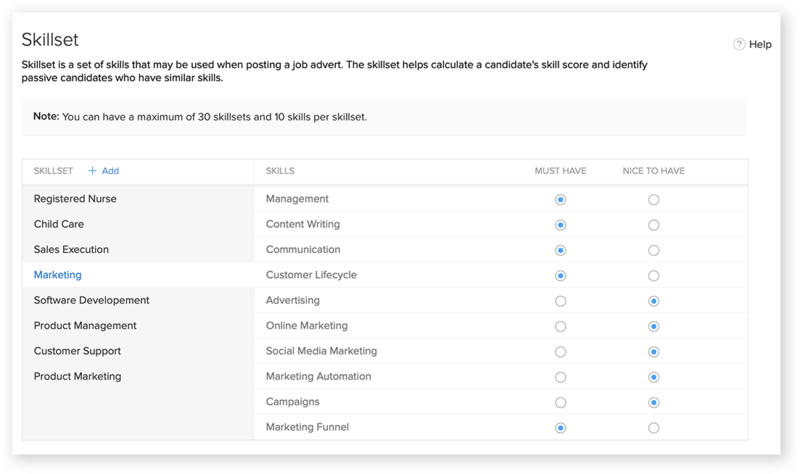 Zoho Recruit’s Assessments feature now enables recruiters to assess and rate applicants during their hiring process, with a set of pre-determined and standardized assessment templates. They can review applicants based on quality, provide notes and feedback, that helps hiring managers to quickly compare applicants based on their average ratings and give the interview teams a head start. As an added bonus, we have completely revamped how assessments work. Now, you can filter assessments by their kind and type and share them with recruiters/candidates accordingly. We have added multiple assessment types that include -- General screening, Pre-screening, behavioural screening and background screening. Learn more. We've enhanced the Simple Search feature even further to help you search and find records swiftly within Zoho Recruit’s Database. Apart from matching search terms with records in the module you are currently in, you can also choose to access the record in its quick view or the detailed view. What's better? All your recent search results would be listed in the search bar to make your work efficient. Learn more. Integration with Gigajob, a job board that caters across all industries and professions. The portal is completely free for job seekers and employers can avail a free basic service. Gigajob also provides employers access to the database of CVs. All users can avail free email alerts to stay updated about new ads that match their search criteria. Learn more. Integration with DrJobs, a leading job search engine that offers unlimited opportunities to applicants and acts as a bridge that connects employers and job seekers. Learn more. Get complete access to Nexxt's candidate database, a job board that allows you to search with specific focus to not just job descriptions, but also include the diversity quotient and different geographical requirements. Learn more. Resume Extractor extension is SSO compatible. Identify, collect and parse candidate information quicker than before. Parse additional candidate education and work history. Get complete access to Resume library's candidate database, that lists jobs from 50 different industries guides applicants with tips on job search, interview process and more. Learn more. Integration with Moje Delo, a Slovenian-based job board that lists jobs from several industries across the country, and also releases several publications around latest recruitment trends. Learn more. 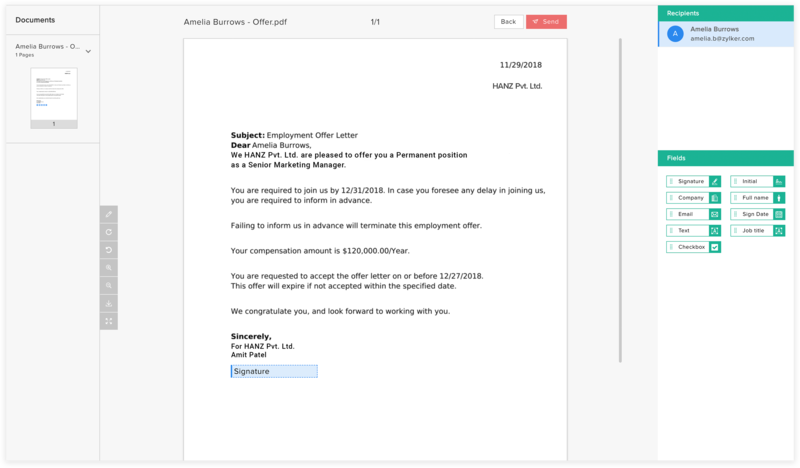 To ensure that top candidates are hired quickly, recruiters can now create and send out offer letters to candidates post their interview process. Learn more. Integration with MailChimp, a very popular marketing-automation platform to enable recruiters to send email campaigns, track open rate, and click rate -- all from within Zoho Recruit. Learn more. With Simple Search find and view candidate, job openings or client records effortlessly, as it prompts the most relevant matches for your search. Adding to our list of existing source boosters is Monster India, giving you complete access to their candidate database from within Zoho Recruit's user interface. Learn more. Integration with Neuvoo, a popular job board has millions of job seekers visiting it every month. Seek the right candidate matches for your job openings from 65 countries with Neuvoo. Learn More. Integration with Nexxt, a job board that allows you to search with specific focus to not just job descriptions, but also include the diversity quotient and different geographical requirements. Learn more. With the Hiring Pipeline widget get a consolidated view of all your jobs and in which stage your candidates are, right at your dashboard. Learn more. Integration with Jobs.ie, an Ireland-based job board, that has over 7 million job alerts sent every month, it ensures that your jobs get maximum reach. Learn more. Zoho Recruit is GDPR ready. With GDPR coming into effect, Zoho Recruit has facilitated recruiters to stay compliant and allow candidates to give consent for usage of their personal data during the course of their recruitment process. Learn more. To deliver the most relevant candidate matches for a job opening, SME helps hiring managers search efficiently with relevant skillsets mentioned in job descriptions. An added enhancement to this is the Radius Search feature that allows recruiters to search within a specific geographical radius. Learn more. Make use of our pre-designed job description templates or customize them as per your requirements to post jobs quickly to job boards and social media. Learn more. 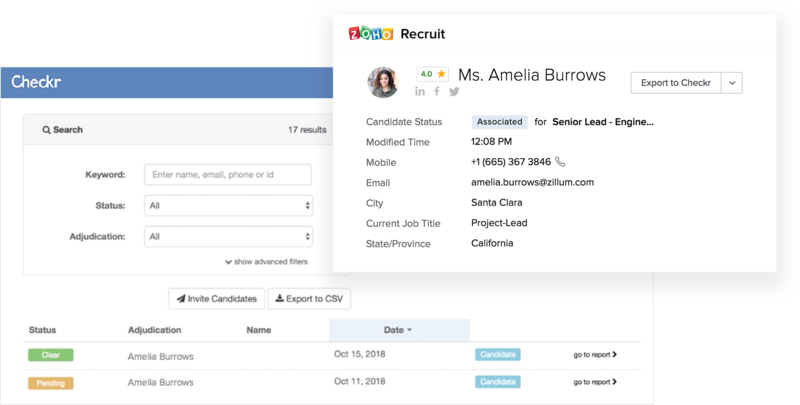 With the Hiring Pipeline feature, get a 360-degree-view of your candidate statuses associated to a particular job opening in the recruitment process. Learn more. Integration with TechFetch, a popular US-based job board that helps IT companies find best fitting resumes open for developers, engineers and coders. Learn more. Keep your team informed of your activities by tagging them with Mentions, and be informed of their tasks and progress with the Notifications tab. Learn more. Recruiters can now post sponsored jobs to Indeed with this integration. This is a paid listing that prominently displays your job postings strategically on the search page. Learn more. Introduced integration with JobBoom, Total Jobs, CW Jobs, CareerStructure, Caterer, and RetailChoice job boards. Introduced integration with Reed, Zoek, Faces2hire, and LogicMelon job boards. Introduced integration with Bayt job board. Introduced integration with Recruit.net, iimJobs, and Hirist job boards. Introduced integration with Jora, TipTop Jobs, Jooble, Expertini and Zoek job boards. Introduced integration with ApplymyJOBS and Trovit job boards. Introduced integration with Zoho Campaigns. Introduced integration with Dice UK Job board. Introduced integration with CV-Library job board. Reduced the price of CareerJet Sponsored job board. Introduced Manual Trigger Workflow feature. Migrated to Daxtra Resume Parser. Introduced integration with Zoho People. Introduced integration with Broadbean job board. Introduced integration with Careerjet job board. Introduced two new features - Indeed Resume Search and RSS Feed. Made enhancements in the Job Opening workflow. Now under Workflow > Rules > Actions, you have the option to choose 'Associated Candidates' under Email Recipients. Also, the workflow alert count for default workflows has been set as 10,000 per day. Introduced bounced email notifications—now while sending bulk emails, if an email bounces you will get a notification about it in your inbox. Made the following update: When contact and job openings are exported, in the exported csv file, now client names will be displayed instead of the client IDs. Integrated with the CareerOne job board. Introduced Custom Buttons feature for the Enterprise version. Resume Extractor has been enhanced— now while associating a candidate, along with the job opening title, the respective client name will also be displayed. Changed the Candidate Login UI for the web version. Introduced the option to overwrite records while importing them in the XLS format for Administrator profile users. Added mobile app icons in the Setup tab. Added Send Mail option in the Client module. Introduced integration with three new job boards - Monster, Dice and Zip Recruiter. Changed the publish to job boards workflow. Added interviewer and guest profiles in the Hiring/Account Manager look up field on the Add Job Opening page. Introduced Mass Invite Candidates option under Candidate Tools in the Candidate module. Using this feature you can now invite candidates in bulk to access Careers page. Introduced Zoho Reports Integration in Recruit. Introduced Change Status feature in Zoho Recruit mobile app (iOS and Android). Increased the custom field limit to 500. Enabled the option to edit email templates under the Send Mail and Submit to Client/Hiring manager features. Enabled email tracking with contacts and users filter in the Client module. The default 'Apply with Indeed' button has been removed from the Careers Website. Users can now choose to enable the button or not. 'Import from Zoho CRM' option has been removed from all the modules and added in the Apps & Add-ons > Zoho Apps > Zoho CRM integration page under setup. Introduced Export to Excel, CSV and PDF option under Activity Log in the settings page. Provided the option to enable Export Activity Log permission for custom profiles. Added a pick list to select users under activity reports. Revamped the Associate Pop-out page in the Job Opening Details page. Added 'Activities' under the Home page components. Increased the number of custom fields from 150 to 300 for all the modules. Introduced Social icon in the Candidates and Contacts list page. Introduced auto complete component in the criteria editor for lookup field. Changed the Contact Support UI. LinkedIn search API has been removed. Pick lists has been modified for locales other than US. Made enhancements in the filter for Candidate Status and Associated job opening under the Candidates module. Introduced live desk chat for Europe locale. Enabled Send Mail and Macros feature for custom modules. Added web forms and assignment rules for custom modules. Careers website and web form has been optimized for mobile phones. Introduced the "Upload your formatted/branded resume template document" option under Formatted Resume feature. Added the option to set the default search module in the search bar to be Candidates or tab-specific. Multi pick list values will now be displayed as a drop-down in the web form along with an added search option to search and select values. Introduced permissions for attachment category feature. Introduced multi-language support for candidate login, forgot password and candidate confirmation buttons on the careers website login page. Introduced multi-language support for the Browse button on web form. Introduced mass email and macro support for custom module. Added event invitation email to the Contact/Candidate related list. Introduced Change pattern option wherever criteria is given - Mass Actions (Update, Delete, Transfer, Email), Assignment rules, Auto Response Rules under Career Website, and Add Existing Candidate in Associate Candidate > Update Member Status action. Added merge fields support for workflow and macro task subject field. Added invited events to multi user day and week view in calender. Introduced Kanban view in Todo's Tab. Revamped the Social tab UI. Introduced Sharing rule support for Activities module. Changed the UI for notes section in the entity page. Added territory assignment for job openings. Introduced web forms for custom modules. Added create template option in the Auto Response Rule Entry page. Moved Audit log and Activity log from Personal Settings to Data Administration under Setup. Moved BCC Dropbox and Zoho Mail configuration to Personal Settings > Email Settings under Setup. Introduced Filter feature in the Candidates module. Increased the length of formula expression field. Modified the default sort option in the Careers Website job list page. Added activity log for when a candidate deletes attachment. Modified the job opening templates in the Job Opening details page under Careers Website. Introduced new templates under Careers Website. Modified the Assignment rule option under the import from document feature. Introduced tags and manual candidate approval under import from document. Saved search option introduced under Mass Email. Introduced Submit to Hiring Manager feature for internal accounts. Released mobile app for iOS. Made redirection changes for the portal domain. Provided acknowledgement message option in web forms. Introduced Resume Inbox and Interview Feedback Form. Removed Formatted Resume from web form (internal account). Changed the job re-publishing date. Now, jobs cannot be re-published if it has been posted more than 45 days ago. Increased field label length from 50 to 250 characters in web form. Candidate-job opening association will now be restored on recovering the particular job opening and candidate. Formatted Resume UI now supports Russian language. Added Terms & Conditions field in web form. Added auto complete option in the Job Opening field under Submit to Client email template. Added 'On Change Status' option under Interview workflow rules. Created Candidate Review Form under Submit to Client email templates. Custom top level domains are now allowed in Candidates/Contact email ids. iCal files will now be sent with Interview and Task notifications. Introduced the option of editing and adding events for interview via API. Web form option can now be selected while publishing the job instead of when customizing the job list in career website. Changes made to the email id in the Zoho Recruit account will now reflect in the user's Zoho Accounts too. Spam jobs approval has been introduced for job boards. Released Resume Extractor in the latest Recruit version. Zoho Recruit released its new and improved version on 20/01/2015. Post job openings as well as the companies' career pages in social networks such as Facebook and Twitter. Issue in sending emails as plaintext has been fixed. Job Description formatting issue fixed. Resume extractor encoding issue fixed. Trigger Email alert while adding records through API. Payments ip restriction issue fixed. Resume Extractor- Source Candidates Instantly! Hangout right panel empty issue fixed for china customers. Other language characters encoding issue. Formatted resume issue for footers and filename template. UI issue IE due to Fusionchart old version issue fixed. Email id not replaced in merge fields issue fixed. It was an amazing weekend. You spent time with family and friends, had dinner at your favorite restaurant and even caught a last-minute show from one of your favorite bands. How to interview candidates live on web? Zoho Recruit is integrated with Google hangout, which helps Interviewers to interview a candidate live on web. Updates filter count while deleting candidate record. You can now create Reports without using any lookup fields. New filter option "Last Mail Sent" added in AdvanceSearch and CustomView to filter resumes using the time of last sent mail. Issue of not syncing event owner with GApps is now resolved. Option has been provided to allow use of different colours to mark events by different users. Fixed an issue when syncing rescheduled events with Google calendar. Customers are prevented from adding users with duplicate EmailId and EmployeeId. Bug fix allowing from and replyTo address changes in email alerts. Issue fixed enabling DOT file format to be parsed in outlook plugin. Wrapping of long label name for customised fields enabled. Issue with selecting SMS field as a number field fixed. Switching payment owner issues are fixed. Highlight issues within documents while searching using special characters resolved. Issue fix enabling merge field option to work correctly when sending email to client contacts. Criteria Pattern Editor enabled for custom view and advanced search. Ability to forward multiple candidates in a single email to clients. Indeed free ad posting enabled for staffing firms. Issue fix $ sign replacement in Merge field option, while sending email. Highlight feature enabled within attached documents while performing searches. Advanced search issue fixed when choosing match all key words. Import candidate as xls issue fixed. Import from doc is enabled for Recruiters in tial version. Customize logo issue fixed. Duplicate attachment for resume prevented.